Lady Gaga and Bradley Cooper reunited tonight on the Oscars stage for a performance of “Shallow” from their movie A Star Is Born. It’s the duo’s first live performance of the track since a show in Vegas last month, as part of Gaga’s 36-date residency at the MGM Park Theatre. The two walked onstage during the opening guitar accompaniment began. Cooper sat and sang to Gaga, while she accompanied herself on piano. 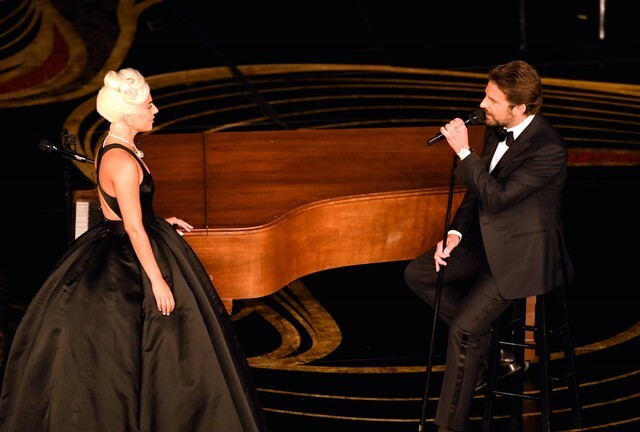 The performance ended with Cooper and Gaga duetting together on the piano bench. “Shallow” is nominated tonight in the Best Original Song category, while A Star Is Born received nominations for Best Cinematography, Best Sound Mixing, Best Adapted Screenplay, and Best Picture. Bradley Cooper, Lady Gaga, and Sam Elliott also received nominated for Best Actor, Best Actress, and Best Supporting Actor, respectively. “Shallow” was originally slated to be one of just a few songs performed live at tonight’s ceremony. Last month, the Academy announced plans to cut live performances of most Best Original Song nominees from the telecast. The decision was met with immediate backlash, and producers have since revised their plan, allowing for performances of original songs from The Ballad of Buster Scruggs, RBG, and Mary Poppins Returns. Kendrick Lamar and SZA will reportedly not be performing their song “All The Stars,” from Best Picture nominee Black Panther, as a result of logistical concerns. Watch a clip from Lady Gaga and Bradley Cooper’s performance below.